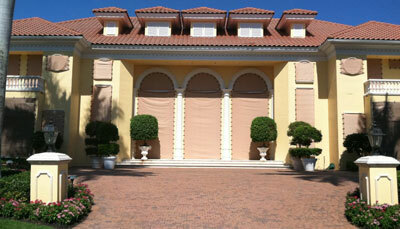 Astroflex by Hurricane Fabric is the first generation series of fabric protection. This is made of a slightly heavier version of polypropylene trampoline fabric. Astroflex is woven so that the fibers are slightly open so as to allow visibility through the fabric. While the impact resistance meets the standards for Florida Building Code, the Astroguard fabric has a much higher resistance to impact and is completely non-porous. This was our first system which was a product born out of necessity. A founder of this company was a pioneering member in the field of fabric hurricane protection whose background is in the sail making industry. Much of how this product works has come from this field where there is decades of innovation in fabric and attachment advances. From the history of sails, we can gain much insight into how fabric performs under heavy loads and what type of attachments are the most secure. Fabric hurricane protection started with one attachment style. This was the Strap & Buckle system. As the years progressed from the late 1990’s into the early 2000’s, a more affordable version was sought which brought about the grommet style of attachment. However, there are serious, if not fatal flaws with both of these systems. After the storms of 2004 and 2006 in Florida, much was learned about the deficiencies and ultimate failures of these two styles of attachment. The strap and buckle method has two serious issues. The first issue is retaining tension of the straps in the buckle. The second is integrity of the thread used to attach the straps is diminished over time by UV exposure. There were many reports of straps coming loose during the storms. This prompted home owners to expose themselves to danger in order to re-tension straps in an effort to keep the system from ultimate failure. In fact, there are many instances that can be pointed to where the system failed as a result of the straps coming loose. We have seen fabric panels come back after the storm with straps that have literally shred to pieces. The grommet attachment system, likewise, is prone to fail. There are two major problems that can and do cause the ultimate failure of the grommet system. The first major concern is the fact that a hole must be cut into the fabric in order to install the grommet. This hole severs fibers which significantly decreased the strength of the fabric. The other issue is that, with a grommet, the metal is only capturing a very small amount of fabric around the cut hole. Fabric tends to stretch differently than metal. As this stretching occurs, the hole in the fabric grows disproportionately to the metal grommet causing the fabric to separate from the grommet. As with the strap & buckle system failure, there are many instances where the fabric came free of the attachment leaving a hole in the fabric edge with the grommet still attached to the fastener in the home. From these failures and inefficiencies of the two popular styles of attachment, the need to invent a secure connection was clear. Once again we turned to the history of sail making to look for a secure method of attachment. We looked at how mainsails on very large boats are connected to the mast. This is in the form of batten end caps. These caps are made up of two separate pieces that connect by bolting together and sandwiching the fabric between the two halves. This method makes the attachment a part of the fabric. However, in order for this idea to work as a means of hurricane protection, it had to have flexibility and the option to connect to parallel and perpendicular structure eliminating the need for metal tracks. This is why we use advanced, reinforced Nylon and have two connection options on our clips. The reinforced Nylon provides both strength and flexibility and the two mounting options eliminate the need for metal tracks. The major factor in effective fabric protection is the need to decelerate flying objects. This flexibility is not provided by the strap & buckle or grommet arrangements. Just like a trampoline, this system, along with the flexibility of our clip, actually decreases the speed of windborne debris and uses this energy to return the object in the opposite direction, away from the house. This is just like a person jumping on a trampoline. The Hurricane Fabric, LLC clip solves the need for a secure connection and decelerates flying debris while absorbing the pressures of wind. It was the failure of the competing systems that brought about the invention of our clip. Our motto is one of “Constant Innovation”. Instead of choosing outdated failure-prone products, make the smart, educated choice of Astroflex by Hurricane Fabric, LLC. © 2019 Hurricane Fabric. All Rights Reserved. Website designed & developed by Jupiter Website Design.